A recent conversation with Carla Corkern, CEO of Talyst, resulted in this week’s Cool Technology for Pharmacy. The LXE 8650 Bluetooth Ring Scanner is a pretty neat, albeit homely, piece of hardware. The device is designed with wearability in mind to provide the end-user with hands-free operation. The LXE 8650 consists of a ring scanner and a Bluetooth module. The Bluetooth module is attached to the wrist via a velcro strap and the ring scanner fits on the finger and is operated by a thumb trigger. The system is lightweight coming in at only 4.8 ounces (136 grams), and that includes the ring scanner, Bluetooth module, battery and wrist strap. The scanner is designed with a magnesium alloy housing so it can take a beating, something that is a necessity in the pharmacy. In addition to the magnesium housing the system is sealed to IP54 standards1 and can withstand multiple drops from up to 4 feet to concrete. Battery life appears to be pretty good and can deliver up to 17,000 scans on a single charge. I don’t know about your pharmacy, but that equates to more than 24 hours of continuous use before a charge is necessary. And because the LXE 8650 utilizes Bluetooth technology it can be used with multiple devices, even the iPod Touch and potentially the iPad. Just take a look at the last video below. 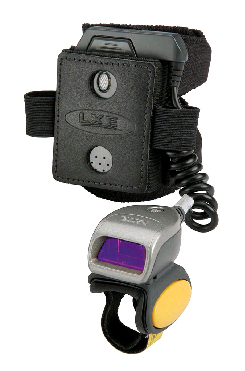 LXE’s 8600 Series wearable ring scanners include the 2D Imager and SR Laser Scanner. The 2D imager ring has a 21″ scan distance and comes with enhanced white LED flash illumination. The SR laser scanner has a 45″ scan distance. Both rings can quickly switch between the right and left hand. The tops are built with magnesium alloy enclosures, and the trigger is a smooth, low-profile magnesium built to withstand tough warehouse environments. 1. The International Protection Rating or IP Code is designed to classify an objects degree of protection against certain solid objects, i.e. dust, water, etc. The numbers following ‘IP’ correspond to the devices specific protection. In this case the ‘5’ in IP54 represents dust protection (dust is not entirely prevented, but it must not enter in sufficient quantity to interfere with the satisfactory operation of the equipment), while the ‘4’ represents splashing water (water splashing against the enclosure from any direction shall have no harmful effect).